Welcome to Stop 34 and Chapter 34 of the CONSEQUENCES audioBOOK blogTOUR! 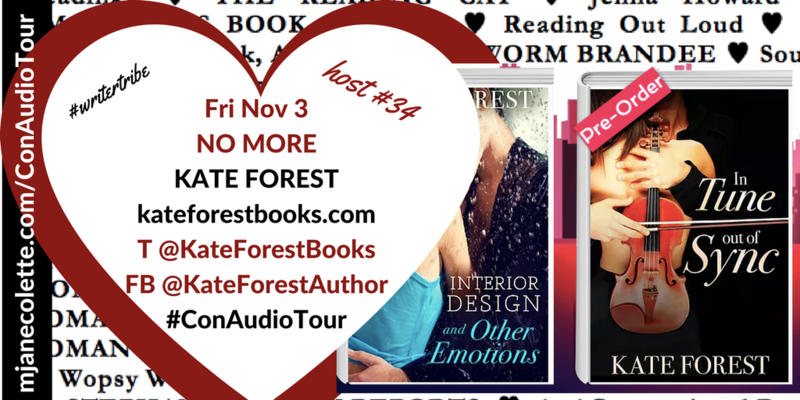 If you’re in a hurry to listen to Chapter 34: NO MORE, hurry over to KATE FOREST BOOKS RIGHT NOW! Me: Run run to KATE FOREST BOOKS to find out! Not in a hurry? Good–stay with me here a few moments. I just need to reiterate how lucky I feel to have so many talented people taking part in the Consequences Audio Tour! Stop 34 (and Chapter 34) are hosted by the talented KATE FOREST, who believes everyone deserves a happy ever after. 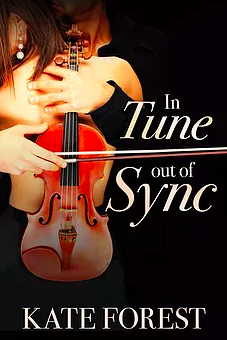 Kate’s beautiful book Interior Design and Other Emotions, was a finalist at this year’s I love Indie Awards, and her newest release–which is in my TBR pile, and it’s KILLING me, I NEED to get to it, In Tune, Out of Sync, released Oct 5. Kate Forest and I met during that Christmas in July blog hop I keep on mentioning (because it was really fun! Thanks again Amanda Siegrist! ), and I managed to browbeat… er… convince her to host the short, sweet, tight and oh-so-powerful NO MORE chapter even though she was swamped with prep work for her own new release. I know I keep on saying it, but I mean it everytime: I am so grateful for the support. Now, get thee to Kate’s blog, and listen to Chapter 34: NO MORE.